With just the right proportion of creamy, nutty, and fresh ingredients– these bruschette are sure to be the life of any party. The arugula & goat cheese variation packs in toasted pine nuts for crunch while the tomato basil offers a clean but complex flavor. 1. Preheat oven to 350 degrees. Brush 1/2 tbsp. olive oil on one side of baguette slices and bake in oven for 5-6 minutes or until slightly brown. 2. Remove from oven and brush remaining 1/2 tbsp. olive oil on bruschette. 3. Divide arugula among bruschette. Squeeze lemon and sprinkle sea salt atop each. 4. Place 1 tsp. 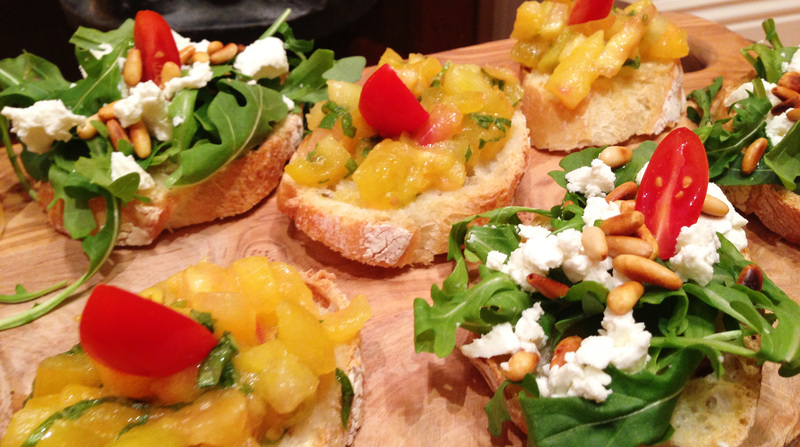 of goat cheese on each bruschetta. Top each with 1/2 tsp of pine nuts and serve. 2. Remove from oven and brush 1/2 tbsp. olive oil on bruschette. 3. Cut each tomato into 8 small pieces. Tear basil leaves into small pieces as well. 4. Place tomato and basil into bowl and add remaining 2 tsp. olive oil, salt and pepper. Gently combine with spoon. 5. Place mixture on top of bruschette and serve.